The adoption of a marketing automation platform (MAP) is a serious commitment for any company. How does the head of marketing know for sure that the time is right, and more importantly what disciplines and processes need to be in place well before one even starts shopping for a MAP. 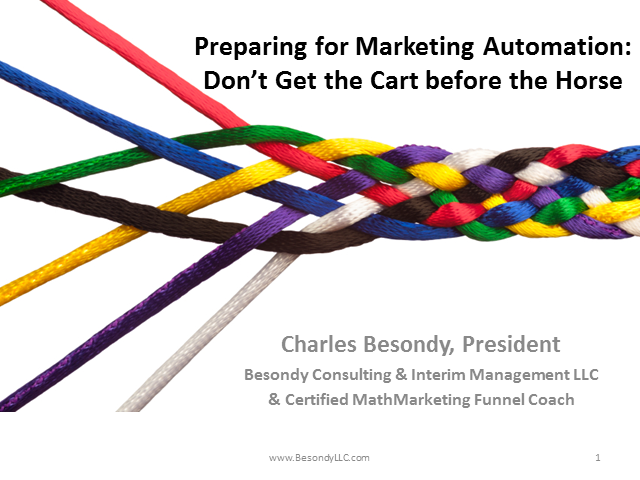 Charles Besondy is recognized as a change agent who transforms the Marketing function in B2B companies so it consistently contributes to revenue growth. Working as consultant or interim executive for companies in North America, Besondy focuses on aligning Marketing and Sales to a single revenue action plan, aligning the skills of the marketing team to the requirements of the business, and aligning the company to the right marketing strategy. Charles is president of Besondy Consulting & Interim Management, LLC. He is also a certified Funnel Coach for MathMarketing, an Australian consultancy.